Why wait for an emergency?
. . . Receive the Benefit of Provident Living Today. Whether you're feeling the pains of economic depression or thriving in prosperity, Provident Living Today will always reward you. Save money now while building for the future. This last year we've been living off our food storage. We'll show you how you can do it too. You will have better health, save money, and build for the future by living providently today. We’ll teach you how to feed your family healthy meals on $1 a day per person. You'll also get healthy, food storage recipes; and a practical plan for building and using your food storage. Last year we had the best garden yet. This year, it's even better. It all came from following the advice of my Dad. Dad’s been gardening vegetables and fruit for over 70 years and is still going strong. You should see his garden! It looks like the Garden of Eden. We'll lead you through a step-by-step process from soil preparation to preserving your food. We'll show you our favorite canning tools and teach you how to use them. You can live 30 days without food but only 3 days without water. Have you ever lived without running water for an extended period of time? Learn several different methods of water purification that you can use during an emergency. Here are a few different alternatives for cooking and cooling your food. These methods of cooking are being used everyday in third world countries. Experiment in your backyard, or take these new tools on a camping trip. You can use a rocket stove or a solar cooker. Currently, we aren't in a pandemic situation, but think ahead. What would you do if you needed to protect your family from a serious contagious disease? There are some natural remedies that you can use at home to help keep your family healthy. We use these natural remedies whenever someone gets sick at our house. They really work! For those of you using disposable diapers, disposable feminine hygiene products, and toilet paper, we have some hygiene products that you might want to think about. It would be an emergency if you ran out of that kind of stuff. We even teach you how to make your own cleaning products. Provident Living Today even includes a little bit of philosophy. Correct thinking is important in any situation. Let us know what you think, and take a few minutes and share your good ideas. Provident Living Today includes all this and a whole lot more. A simple lifestyle of frugal living brings peace and safety in a world that is constantly changing. Try It . . . You’ll Love It. How Can You Support PLT? When you're shopping for anything on Amazon, use this Amazon link. Your Amazon price doesn't change, and it helps Provident Living Today. Thanks for your support! Provident Living Today came as a result of wanting to share many of the things we've learned over the years. Here's a little about us. The Provident Living Today Blog keeps you up-to-date with additions and changes to the provident-living-today.com website. Subscribe here. Prepare for the future and save money today using these healthy garden and food storage recipes. Use these home-cooking recipes for healthy food and learn to use your food storage and garden veggies. Keys to gardening vegetables successfully. Learn how to grow many different garden vegetables. Click on the Picture Links. . .
Fruit is grown on vines, bushes, trees, or small plants. Learn the keys to growing fruit successfully by clicking on the picture links. 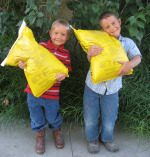 As you use this organic fertilizer, you'll be amazed as you watch natural soil begin to produce larger, healthier, better tasting produce and abundantly beautiful plants. Have you ever seen anything like the Egyptian Walking Onion? New onion bulblets are growing on top of the plant. These perennial onions are a unique, valuable addition to every garden. Once you learn the basics of dehydrating food, you'll get excited about all the food you can preserve. Start storing vegetables and fruit from your garden. Apples, Beets, Carrots, Garlic, Onions, Potatoes, Pumpkin, Tomatoes, and Winter Squash can be kept fresh for part or all of the winter. 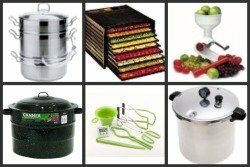 An important part of your home preparedness plan is gathering basic home canning equipment essentials. You can use this equipment year after year. You can only live three days without water. 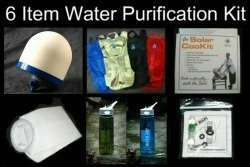 Learn simple and effective methods of water purification. Here is a complete filtering system in backpack form. This backpacking water filter is perfect for emergency water or hikers. Cooking with Solar is so easy with these Solar Cookers. Learn how a solar cooker works. Use these three methods of alternative refrigeration to keep your food cool when there's no electricity. EcoZoom Rocket Stove has a stronger more efficient design, burns cleaner, uses less fuel. Are your prepared to keep your family healthy during the H1N1 Swine Flu Pandemic? Having these emergency hygiene and sanitation supplies is an essential part of any emergency preparedness kit. Save big money with Couponing 101. Beware . . . Saving money can be addictive. After creating about 200 web pages on physical preparedness, I have felt to talk about preparing the heart. Physical preparedness is incomplete without preparing a place to experience peace and joy. Three great stories that illustrate the benefits of capitalism plus humorous video "The Government Can"
Are there real conspiracy theories? The way you see what is happening in the world around you is profoundly affected by the way you answer this one question. Site Build It - Do what you absolutely love everyday! You have a passion the world would love to here about - Site Build It! Get ready to plant your garlic. 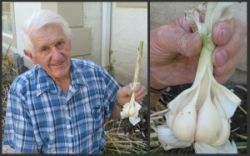 Plant your garlic in the FALL. There are 6 varieties available. These are some the Canning Supplies we use. We'll show you how. Water is even more important than food. Think ahead. 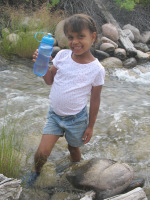 What are you going to do if you can't get clean drinking water? There are many ways to purify your water. Have you ever seen anything like it? New onion bulblets are growing on top of the Egyptian Walking Onion. These perennial onions are a unique, valuable addition to every garden.